Gear up for Spring Break in Portland, Oregon with online screen printing and custom sticker specials from Hart (Heart) Mind Soul and the HMS nation. Offering the highest quality apparel and BEST screen printing services near Portland, OR, it is obvious why the HMS nation is your premier choice for everything from Organic cotton T-shirts and sustainable (eco friendly) hats to DryFit performance long sleeves, hoodies, Zip Ups, custom embroidery, tank tops, racer backs and more! Need custom stickers for a special event or Spring Break getaway near Portland, Oregon? 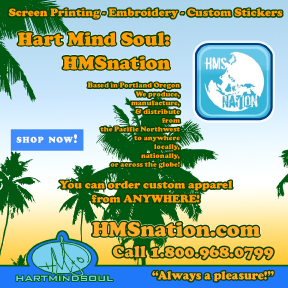 The industry experts at Hart (heart) Mind Soul custom screen printing and stickers are here to help. With RUSH printing services and next day air shipping options, Heart (HART) Mind Soul is the BEST solution for custom tank tops, racer backs, t-shirts, stickers and embroidery in the greater Portland area. From Gresham to Hillsboro and in between. Contact the HMS nation today for internet offers on custom screen printing services. 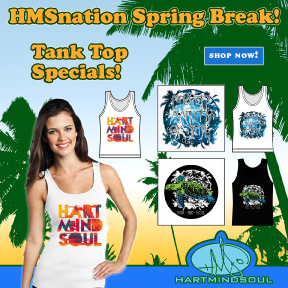 Make sure to view our selection of men’s and women’s custom screen printed and digital print (sublimation) tank tops for the perfect Spring Break fashion and styles from Hart (heart) Mind Soul and the HMS nation in Portland, Oregon. Call – 1800.968.0799 or visit HMS nation online for guys and girls tank top specials near Portland, Oregon. best stickers screen printed Portland Oregon, fashion style Portland, HMS nation hart heart mind soul, Portland screen break specials, Portland screen printing specials. Bookmark.